ww2dbaseTadamichi Kuribayashi was born in Nagano prefecture, Japan to a samurai; in fact, he was the fifth generation of the Kuribayashi family that served six emperors as samurai. Canadian-educated, he was assigned to be a deputy military attaché in Washington DC starting in 1928, traveling extensively. When the Pacific War was able to begin, he was a known opponent of provoking United States into war; "[t]he United States is the last country in the world Japan should fight", he wrote his wife once. He was largely ignored by the decision makers. ww2dbaseIn May 1944, the tall and husky Japanese general (he was five feet nine inches, above average for Japanese men at the time) was handpicked by Emperor Showa and Prime Minister Hideki Tojo to defend the island of Iwo Jima. Veteran of thirty years with recent field experience in Manchuria and China, he was given the honor to personally meet Emperor Showa in Jun 1944 on the night before he flew to Iwo Jima. The meeting was an honor rare even for samurai, and he was told by Emperor Showa that the American "barbarians" must be stopped. ww2dbaseKuribayashi did not share the optimism some of his peers had, but he performed his duties. He closely studied the island's terrain and decided that he would not fight on the island. He was going to fight from inside the island. Under his instructions, 21,000 men were hidden in 13,000 yards of tunnels. On Mount Suribachi alone there were 1,000 cave entrances and pill boxes. He gave the following orders to his men. "We are here to defend this island to the limit of our strength. We must devote ourselves to that task entirely. Each of your shots must kill many Americans. We cannot allow ourselves to be captured by the enemy. If our positions are overrun, we will take bombs and grenades and throw ourselves under the tanks to destroy them. We will infiltrate enemy's lines to exterminate him. No man must die until he has killed at least ten Americans. We will harass the enemy with guerilla actions until the last of us has perished. Long live the Emperor!" Knowing the American forces could not be defeated, he could only hope to inflict a casualty rate so high that the Americans would turn back. Among his numerous letters to his family during WW2 was the note "[y]ou must not expect my survival" that illustrated his unfaltering loyalty despite of certain doom that he knew he could not escape, as according to Bushido code. ww2dbaseOn 22 mar, Kuribayashi radioed "[w]e are still fighting.... The strength under my command is now about four hundred. Tanks are attacking us. The enemy suggested we surrender through loudspeaker, but our officers and men just laughed and paid no attention." On the next day, he sent Chichi Jima this final message, to be relayed on to Tokyo: "All officers of Chichi Jima, goodbye from Iwo". He reportedly committed ritual suicide, but his body was never found. ww2dbase"Of all our adversaries in the Pacific, Kuribayashi was the most redoubtable", said United States Marine Corps General Holland Smith. 1 Jan 1891 Tadamichi Kuribayashi was born. 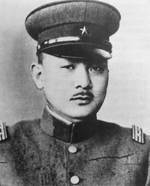 25 Mar 1945 Tadamichi Kuribayashi passed away on Iwo Jima, Japan. He reportedly committed ritual suicide, but his body was never found. thats what I call a brave man. I say too: Watch Letters from Iwo Jima!!! If there is anything Letters from Iwo Jima should have taught any of us is that to win a war you must destroy the enemy. It is your will to win that will decide victory. I hear everyday about the losses of our guys in IRAQ. America Lost 6,000 men in 28 days in that battle. Much more in the entire war. Ask yourself, is living in peace in your own country worth the life of a man defending it. Before you answer, remember, I took an oath to defend it (to the death if necessary). God Bless America, our President and for world peace. To Lieutenant Commander D Indeed to win a battle you must destroy your enemy completely, and who invaded IRAQ?, it were the americans that what every Iraqi resisting american occupation is doing. I am sorry you talk about world peace but the american attitude is full of arrogance and ignorance, towards others values, religion, customs and LIFE. You talk about 6,000 us troops dead but what baout those above 150,000 iraqi causalities, one american life is not worth more then any one else. I pray that may the world get rid of people such as Bush, Chenny and Osama who could only preach hate and violence. What is your point Lieutenant Commander D? Iraq war is unjust and American soldiers are paying the price of a unjust war for BushCheney arrogance. Everythings about Bush, isnt it? You people are neurotic, and deserve to stew in your hatred. WOW are u serious stop freakin babbling about stupid crap. this is like a memorial to this great warrior...and u guys defile it with the Iraq war and other stuff that has nothing to do with KKuribayashi if u got nothin to say about him, then stop posting ur moronic psycho babble. What a great man. He chose to think out of the box and proved a formidable adversary. He chose to die side-by-side with his men, knowing the entire time that death was inevitable. If all of us could go to our deaths with 110th the courage and conviction, living would be easy. wow,he seems really amazing sacrificing his life for his country..
Bravery, ingenuity and character is to be admired no matter which side a man is on. I admire General Tadamichi Kuribayashi,as well as Gen. Patton, Field Marshal Rommel, and men like them no for their winning or defeat, or which country they served, but because each man had character, and each man is an example of the best a warrior can be - faithfull to his duty. Please, honor his loyalty to the country he defended as if it was your own. We must also remember he was the enemy and be thankful our brave and honorable marines and sailors were victorious. Lt. General Tadamichi Kuribayashi was a great samurai lived and died for his country let us bow down our heads paying respect for his soul and glorify sacrifice. Tadamichi Kuribayashi...what a great warrior, excellent movie. Is worth watching and getting the perspective from the other side. i admire the character of kuribayashi. he never underestimated the power of the enemy, he were also openminded too. such a brilliant and patriotic but not chauvinistic person. if indonesia now has a good leader like him, im sure that malaysia and singapore will respect us and never bothering indonesia. i love kuribayashi very much. i wish some day i could be like him, a brave, patriotic, crital, but peaceloving. Gen. Kuribayashi was a warrior but definitely not a hero or great man. People like Sophie Scholl and Klaus von Stauffenberg who sacrificed their lives to fight tyranny, were the true heroes in WW2. Was Kuribayashi a Good man?, was he an Honorable man?...Was he a great General?...The primary aspect to his significance, in my view, is his similarity to Admiral Yamamato. Who like General Kuribayashi, knew very well, having visited the United States as well as serving as military liason there, knew that for Nippon to jack with the United States in general war was suicide,and he also knew why. So, like Admiral Yamamato, to give so much devotion to his country and distinguish himself in battle the way he did...well, its at least remarkable. I watched both movies Flags of our Fathers, and Letters from Iwo Jima. Both are incredible and gave a real perspective on the nobility of people caught in a war most did not want to be in, but because of circumstance, and stupidity of the chosen leaders of their countries, had to fight. The soldiers were true heroes, on both sides. Neither side were the villains. The real villains were the politicians who designed the war. A great man who even made a defeat much more glorious than the victory. A great warior an epitome of honour. If, ever, a definition of a soldier is needed it will be one word Kuribayashi. One of Great Leader, equally with Mc. Arthur either Nimitz. Tadamichi is a master of defence. Instead of fighting enemy at the beach, he preferred hiding his troops underground. Thus, Naval bombardment was useless and USMC must pay heavy death toll. I must say he is equal to Rommel in terms of strategy and leadership. Feldmarschal Walther Model was a master of defense. Feldmarschal von Manstein was a master tactician. Feldmarschal Rommel was a master of deception. I can say is that Gen.Kuribayashi was a great General he was a very strategic fighter he knew where to put his men he learned a lot from the americans who trained him! LTG Kuribayashi was a true soldier who did his job to the best of his ability. I am thankful that the movie Letters from IWO JIMA was able to show the skills and experience of LTG Kuribayashi as well as his humanity. Also, the movie showed the other Japanese officers and men with their different personalities and characters. I grew up watching WW2 movies which often portrayed the Japanese as fanatical barbarians or stumbling buffoons. You are all fools if you forget that this man fought and died for an aggressively expansionist regime. A regime responsible for unspeakable atrocities against Americans, Chinese, Brits, and other nationalities too numerous to itemize here. Imperial Japan had no respect for other peoples and this insanity resulted in a totally unprovoked invasion of China for which the civilized world implemented a trade embargo on strategic resources reaching their militaristic and backward culture. Kuribayashi is a tragic figure, yes, and we all sympathize with him. But he is in no respect a model man. Nor is he a hero. He may not lay claim to the mantle of heroism. A man may not set aside reason to pursue glory and be remarked on later as anything but a victim. The movie Letters from Iwo Jima includes a quote from the mother of an American Marine killed by the Japanese on the island. It says, "Do what is right always, because it is right." Did Kuribayashi fight for what was just and proper? When talented men set aside what is right and inflict war upon the world such men are enemies. To hell with Kuribayashi. He lived his life like a lantern in the wind. Respect is due...Banzai! "Of all our adversaries in the Pacific, Kuribayashi was the most redoubtable", said United States Marine Corps General Holland Smith. That's a lot coming from an American General. In war it's not about how shiny your boots or how gentlemanly you are but how intelligent, prepared, menacing and formidable you are. For those of you who think "oh, he's just another general, he doesn't know what he's talking about", he commanded the American forces at Iwo Jima. Great movie. It is a shame that so many of us Americans have learned our history from movies. The Japanese were defending their homeland because they had started the war. Their tiny island no longer had the natural resources so desperately needed for expansion. So in your praise of the japanese defending their emperor and homeland it shoud be remembered it was because they had put it in jepordy. Tout un homme, je suis canadien français, cet homme avait un code d'honneur chose assez rare aujourd'hui dans toutes les sphères de la société j'ai vu les lettres d'Iwo-Jima de Clint Eastwood qui a rendu justice aux soldats japonais, ce film a changé la perception que j'avais des soldats japonais de cette époque que d'autres films du passé décrivaient comme des barbares qui n'avaient aucuns respect de la vie humaine. La dictature impériale a malheureusement tueé, fait tuer des milliers de ces hommes (suicide apparemment obligé) qui auraient, aujourd'hui été des témoins importants de cette guerre, ce que les dictatures peuvent faire aux Hommes. Cela m'a choqué quand les 2 GI ont tué les deux soldats japonais qui étaient leurs prisonniers, je ne juge pas ces hommes de guerres loin des horreurs de la guerre (Clausewitz) toutes les armées ont eu des hommes qui l'ont fait dont certains doivent être encore hantés par ces gestes. Je sais que le monde ne changera pas, des guerres il y en aura tout le temps mais moi je garderai toujours vivant la mémoires de ces hommes de guerre qui, en d'autres temps auraient été des mécaniciens, docteurs, acteurs, instituteurs ou vivant, tout simplement. In response to FRS: I don't remember any part of my entry that had anything to do with a movie, maybe you can point that out for me. The fact that Kuribayashi was able to hold off an American force for 35 days (which was intended to last 5 days by the Americans) is testament to his sheer skill and ability as a commander. Never underestimate your enemy. I'm sure every US military college will teach the same thing. I love this man for working with the good side against the Nazis. Would you finish the game. I'm Japanese.In Japan,many people didn't know about him before they watch the movie.now many japanese respect him as good leader.why? On Iwo jima,he always spent similar life to soldier. In those days,many other generals spent different life from soldier. there is no river and well on Iwo jima.so they should store rain water. (when the U.S. Army hoisted the flag on Mt.Suribachi ,parts of the tank of storing water was used as pole which was life line for Japanese soldier.) Kuribayashi saved water just like other soldier and cultivated the field,when he orderd all soldier to save water and cultivate the field to obtain food. "Kantou no Tikai" We shall defend our bases to the limit of our strength. We shall take bombs and throw ourselves under the tanks to destroy them. We shall infiltrate enemy's lines and exterminate them. We shall shoot at each one deadly shot. We shall never be killed before killing ten enemy soldiers. We shall harass the enemy with guerilla actions until the last of us. why he wrote not "Soldier shall...." but "we shall"? to hold the island against superiour american forces without supply, food, water or reinforcements with his clever tactics....thats heroic. he had no chance to win the battle but he and his man continued fighting. until the last man. kuribayashi was a brave man. a real samurai. it is not important, for wich country he died. it is important that he has not given up. he died for that what he believed in. and that is the reason why we should remember him. I just finish watching it! Awesome story. We fight to defend our countries, we are enemies, but at the end we are fighting for the same reason, to protect our families, our loved ones. We are no different, unfortunately it's the nature of the beast, humanity is meant to destroy each other. Enrique we all know war is evil and madness, but he is Anonymous is right, I salute Lt. General Tadamichi Kuribayashi, because he was a great soldier. As a soldier you hate the enemy, but have to respect the man behind the uniform. He is fighting, he is the enemy, but unfortunately, he has a job to perform. I hate war, but they are the reason you can sit here right now, and have fun infron of your computer today! My favorite WW2 general He was a real warrior, Hats off BANZAI !! Tadamichi Kuribayashi is a hero! Tadamichi Kuribayashi was a perfect gentleman soldier. Even he knew not to stir the waking giant. It is to bad his Emporer allowed him to be sacrificed for a lost cause. No question the bombing of Pearl Harbor was the beginning of the end for the Japanese Empire. first of all thank you to mr. eastwood who brought to us such great movies! ltg kuribayashi indeed a great warrior. feldmarschall rommell also. mr. patton and mr. nimitz too. mr. montgomery too, but i think if mr. rommell got more supply, then he had no chance at all. those folks are great warriors. alas we outnumbered! I would like to remind all of you, that whomever is facing certain death in the line of duty, is a hero. If you fight for your ideals, your beliefs, then you are a hero. Letters from Iwo Jima was a good reminder that the real enemy is war, not the people your are fighting. Both Americans and Japanese showed extraordinary courage and defied all odds to help their comrades, in life or death. I am not talking of hippie crap, because those people have no idea what war is about. War should be avoided at all cost, for it causes but misery and pain. However, if war is to erupt, one is show courage for his country, and follow in the footsteps of Gen. Tadamichi Kuribayashi. I like and admire Tadamichi Kuribayashi for being one of the more rational and competent Japanese army generals of the WWII era. Sure, General Kuribayashi was courageous and did his duty faithfully to the end by fighting to his death. However, by sending himself and virtually all his men to death, did he really do the right thing in Iwo Jima? Wouldn't the correct thing for him (or indeed any generals) to do was to surrender when the odds were overwhelmighly against him and his men? Think of all the young men, both from Japan and America, who died in Iwo Jima. Countless lifes would have been saved if the Japanese surrendered earlier when it was beyond all reasonable doubts that the battle had been lost. Would you still feel that the General did the right thing if you were the parents of one of those who died needlessly there? I appreciate that in those times all Japanese military men had to act honourably and that surrendering wasn't really an option. However, in my opinion, in no circumstances this should justify a general sending his men to kill themselves instead of surrendering. 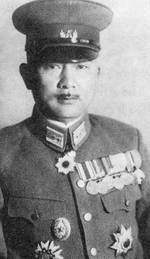 That said, General Kuribayashi was one of the more sensible of his peers as he did not send his men to Banzai charges until the very end. For this, and also of his tactical ability and courage as a general, I admire him. He staid defending the island because of many reasons, one of the main reasons was that the island could be used as an airbase and if the enemy could get control of it they could bomb Tokyo and other cities. He wanted to keep the people in the main soil of Japan safe and he was very loyal man, if Japan would command to keep an area in control he would, no matter what. This kind of loyalty was shown in the battle of Iwo Jima. Wow he must have known he was going to die. So he went down fighting fearce. Leaving a scar in our nations history. Also, the bushido of the Showa years was not the same bushido of the years before. The Showa bushido was a perverted version, aimed only at loyalty and duty to the emperor. Basically it was a "let's all die happily for the emperor" ideology. Original bushido has several other virtues and the emperor plays no role in them. One of them is compassion. There was no compassion in Showa bushido. Not towards the enemy, as murdering civilians and POWs proves (murdering Chinese POWs, by the way, goes back to an order signed by Hirohito himself), but also not towards the Japanese people, as Okinawa (where Japanese troops used civilians as human shields, murdered civilians who refused to commit suicide and gave schoolgirls handgrenades) and Hirohito's and the rest of the leaders' ignorance towards the plight of the Japanese people proves. I don't think I know anyone who is sane has experienced combat who wants to see it again. I too say see the movie "Letters from Iwo Jima" I think it is Clint's masterpiece. It was absolutely necessary. Thank You. I just watch "Letters from Iwo Jima". General Kuribayashi knew how to lead and inspire his men even in the face of certain death and he did so to the best of his ability. All Japanese should be proud of this hero of Japanese arms. I'm glad that today the Japanese are our allies and not our enemies although it took a devastating war to make it so. I find this particular Japanese general a very intellgent person in both his tactics & way of dealing with those fat americans. I did my thesis on Iwo Jima and Lt. Gen. Kuribayashi was easily one of the most interesting personalities I've studied. Major Yoshitaka Horie's "The Fighting Spirit" is an interesting look at the events from an officer who maintained close contact with Kuribayashi. I also highly recommend Gen. Holland M. Smith USMC's autobiography (of sorts) "Coral and Brass" for a view of events from a Marine C/O's perspective. Rest easy my friend, you died not in vain, a new generation shall arise to honor your sacrifice and avenge you. I promise that! I served on Iwo Jima at the U.S. Coast Guard Loran station in 1970/71. It is no longer extant. Below the station was reputedly the bunker in which Kuribayashi directed much of the battle. Some places imprint an emotion, and I always felt a distinct quality of reverence that emanates from its walls, like a tomb or church. When I read of Kuribayashi's determination to save innocent civilians from american bombing, it becomes clear that there was a purity of heart in the efforts of He and his men that is enshrined in that bunker. I also painted the Marine Memorial on top of Suribachi. It is small, simple, and dignified, and posited on the edge looking north over the expanse of Iwo Jima. Across from it are the Japanese memorials, resplendent in gold and marble, but no more honorable. We were specifically instructed and warned never to enter any caves as it would have demeaned the souls of the japanese soldiers not yet discovered and purified with Buddhist ceremony. When you walk around that island, especially at night, there is a solemnity not explainable in the peaceful weather. It is not so much mournful as an annunciation of duty relinguished to the cold hand of implacable death.